MUD, MUD, MUD, MUD, MUD! 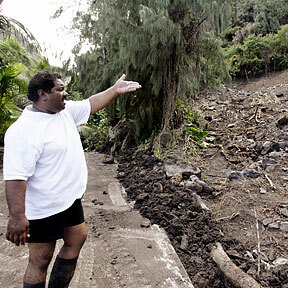 Doug Kekona showed yesterday where a landslide crashed through near his house next to the Crouching Lion Inn. Money could go into a rainy-day fund if voters agree to amend the state Constitution. A rainy forecast keeps Windward residents on a hair trigger. A tournament at the Hawai'i Convention Center draws the best Magic players from all over the world. Hawaii doesn't want a third straight "one and done" in the WAC tournament. The carrier is adding a leg between Orange County and Sacramento to get more use out of its plane. A bill to set up a panel to review the possibility of eliminating some public schools is advancing in the state Legislature.